David Chrisinger is a mil-blogger, veterans-issues activist, and creator of a military-to-civilian reintegration course, "Back from the Front," at the University of Wisconsin-Stevens Point. Related to the latter effort, Chrisinger helped produce and publish an anthology of student essays. 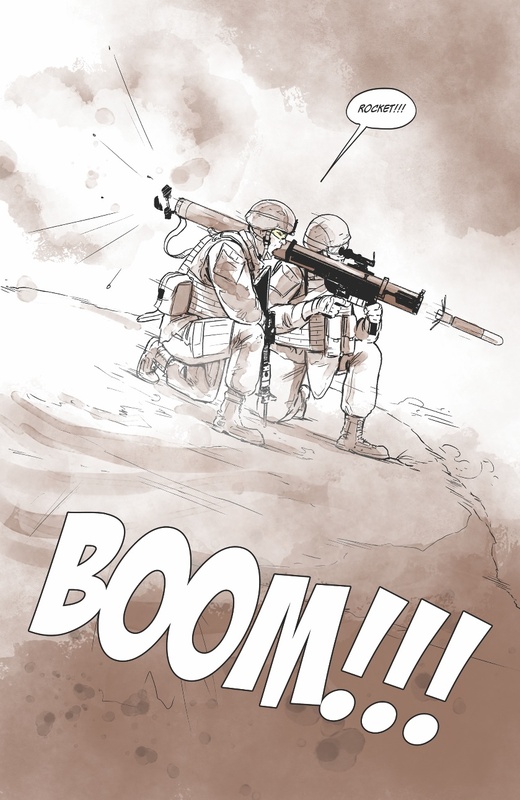 The 150-page trade paperback, "See Me for Who I Am: Student Veterans' Stories of War and Coming Home" was released earlier this week. It is also available as an Amazon Kindle e-book. 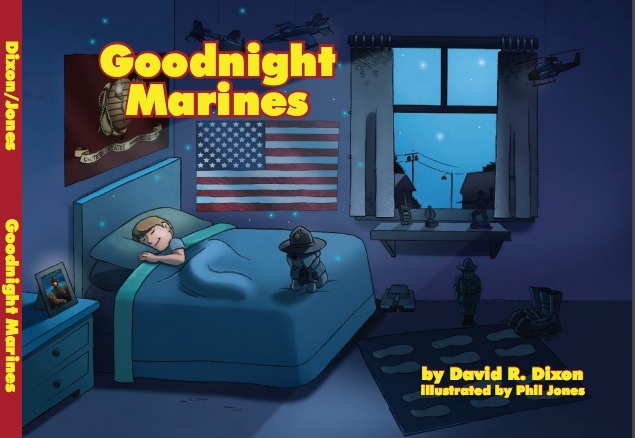 The book collects approximately 20 veterans' stories, written in various voices and styles. 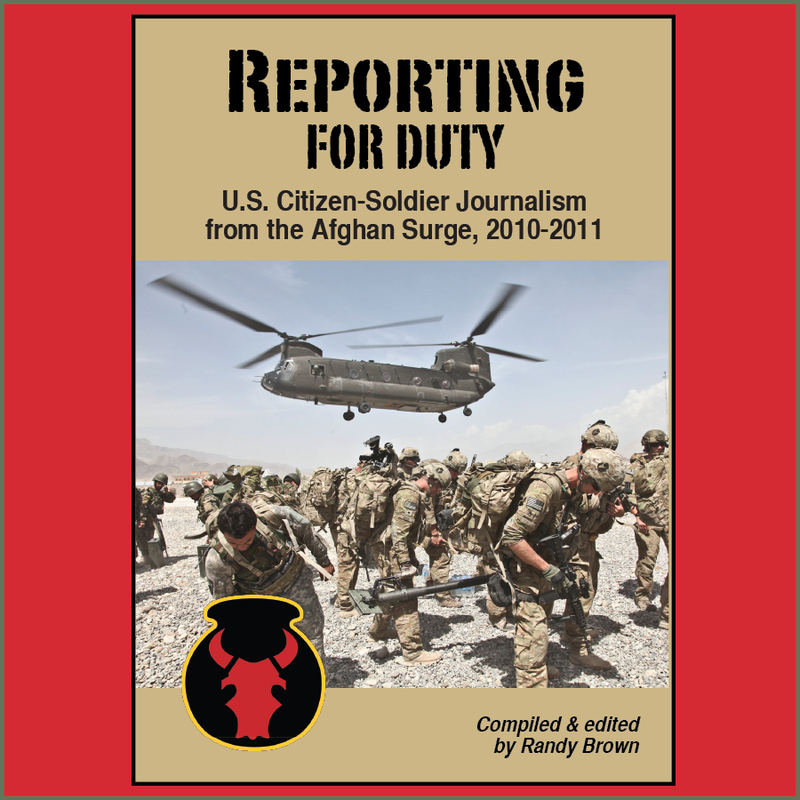 While a few aspire to literary gymnastics or even melodrama, most achieve a conversational and approachable tone—perfect for exposing civilian readers to veterans' insights, without risk of scaring them off. The uncultivated nature of this book is exactly what makes it required reading; that rawness is what sets this book apart from others on the same topic. These college freshmen—often older and worldlier than their peers—are walking straight off the battlefield with the dust still trailing off their boots, the blood still speckling their uniforms, and the gun smoke still stinging their nostrils. There is no irony here; See Me for Who I Am is real talk. The real talk here, admittedly, is from a relatively homogenous cohort of student veterans. An informal sampling of writers' biographies reveals that these are Midwesterners—most grew up in Wisconsin or graduated from high school there. Declared majors cluster around the strengths of the institution in which they are enrolled: business and information technology, medicine and health, forestry management. Most are male narrators, but there are a few female voices present. While this may accurately reflect the composition of Chrisinger's reintegration classes, it does point to possibilities for future explorations. The book illuminates, after all, the types of conversations possible on any campus of learning, if professors and fellow students were to approach incoming student-veterans with open minds and open ears. 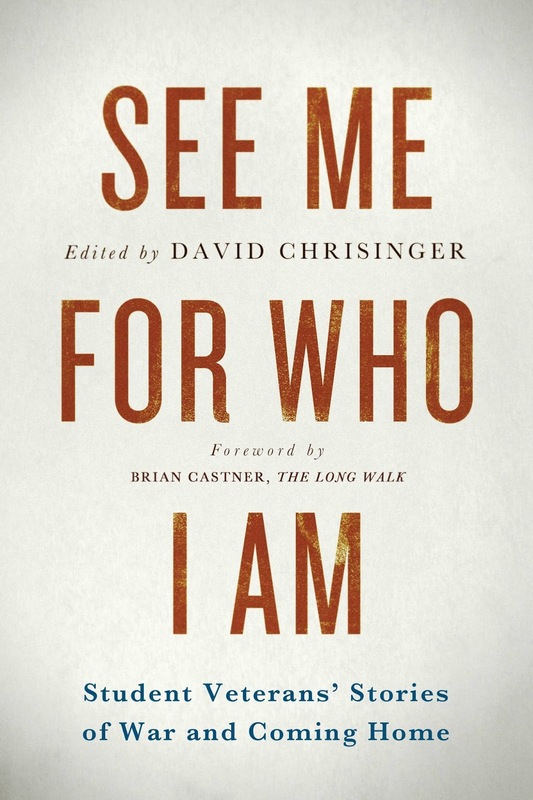 It would be exciting to see other student bodies, faculties, and administrations adopt "See Me for Who I Am" as the catalyst for initial engagement, then move toward generating and collecting other narratives on their own campuses. 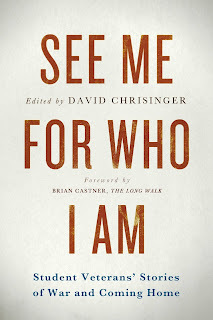 Read "See Me for Who I Am." Then, look more locally. Seek out more stories. And start talking. 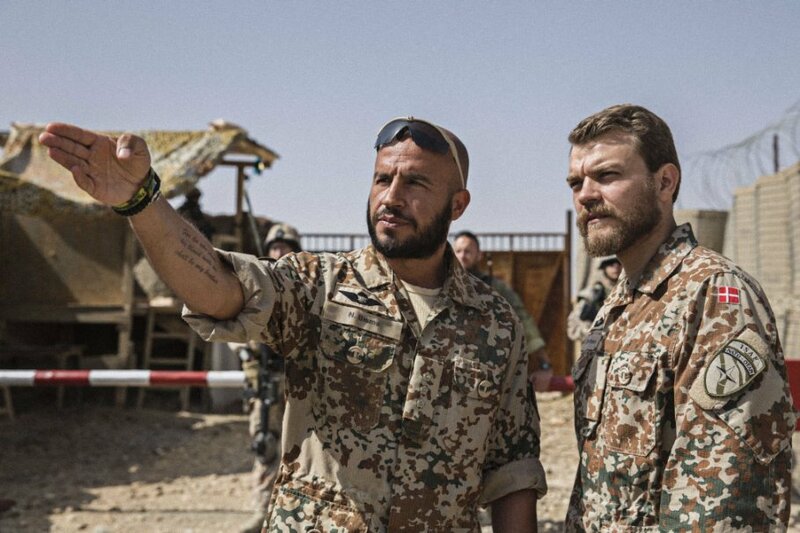 Dar Salim ("Najib Bisma") and Pilou Asbæk ("Claus Pedersen") in the Danish-language film "A War" ("Krigen"). 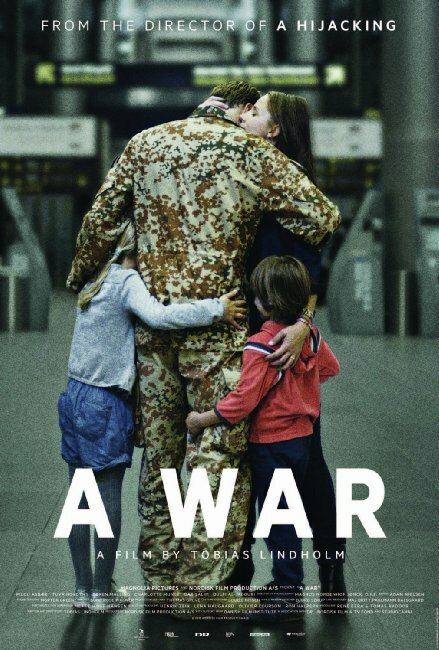 Currently nominated for an Academy Award in the foreign language film category, the 2015 feature film "A War" tells the story of a Danish Army company commander deployed to southern Afghanistan. The movie opens in U.S. theaters Fri., Feb. 12, 2016. After his unit's morale implodes following an I.E.D. attack, Danish officer Claus Pedersen chooses to leave the relative safety of the Tactical Operations Center ("TOC") to patrol alongside his troops. From this vantage, Pedersen witnesses the life-and-death results of his decisions, both for the men and women under his command, and for the Afghan men, women, and children who are his mission to help. Meanwhile, at home, his wife Tuva navigates the challenges of raising three young children. When a command decision results in possible civilian casualties, and is questioned and investigated by the military police, Pedersen returns to Denmark for civilian trial. The film is an accessible, realistic depiction of conflicting perspectives, and nuanced responses to war. Civilians and military superiors have the advantage of hindsight and high morality, and desire to see a situation retroactively resolved as either black or white, wrong or right. 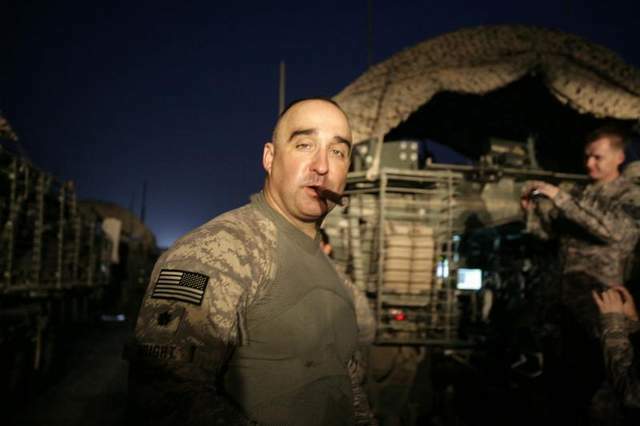 Troops on the ground know that there are no easy answers, and that many tactical choices are gray with uncertainty or lack easy ethical reference. Spouses understand the sacrifices soldiers make in their separations, but also live with the daily wear and tear those absences demand of family life. Despite the high stakes, the film is not sensationalistic. In its content, the film evokes similar events and emotions depicted in the 2009 Danish documentary "Armadillo," without that production's highly stylized soundscape or surreal saturations of color. Instead, "A War" is a straight-forward, somewhat stoic story, in which are distilled many internal conflicts: What's right for the mission vs. what's right for the troops? What's "right" for the military vs. what's "right" for civilians? What's the right answer for legal purposes vs. what's the right answer for family? The movie quietly asks hard questions, and often provides tough, if subtle, answers. Perhaps counterintuitively, that the film regards military and legal contexts other than that of the United States makes it potentially more accessible to U.S. audiences, and particularly U.S. military veterans. As a foreign language film, a U.S. viewer is likely to see all parties in "A War" equally as the "other." Freed from internal questions about the verisimilitude of how U.S. troops should look or act (Danish troops are allowed to grow beards, for example), or the proper U.S. court-martial procedures, the viewer-veteran is free to consider the moral questions laying beneath the story's surface. Were "A War" to portray a U.S. military experience, it would be too easily viewed by soldiers as "Us vs. Them." "A War" isn't about Us vs. Them, however. It's about all of us. For a trailer of "A War," click here. Or view the embedded video below. For an Internent Movie Database (I.M.D.B.) listing, click here. A Facebook page for the movie is here. 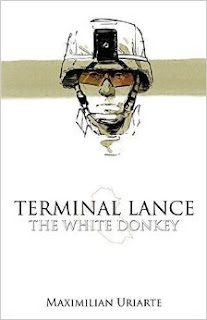 As mil-humor enthusiasts and web comic fans can attest, Maximilian Uriarte's graphic novel "Terminal Lance: The White Donkey" has been a long time coming. And it has been worth the wait. 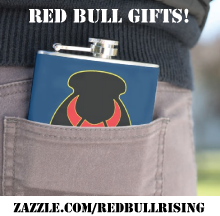 The Iraq War veteran and former Marine successfully funded his magnum opus in August 2013. The 284-page book released on Feb. 1, 2016, and quickly sold out. The creator has hinted at making arrangements for another print run. 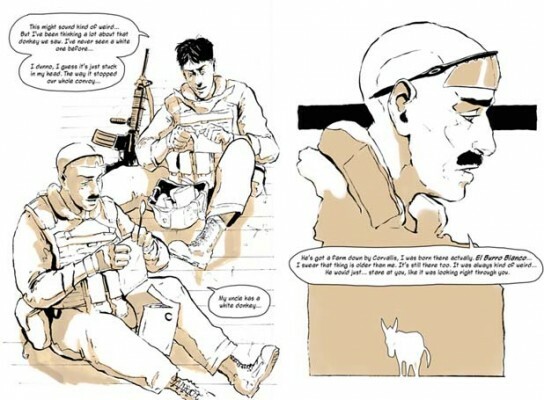 The White Donkey tells the story of Abe and Garcia, two fictional characters who have previously appeared Uriarte's "Terminal Lance" three-panel comic, which publishes twice weekly on-line, and weekly in the Marine Corps Times print edition. 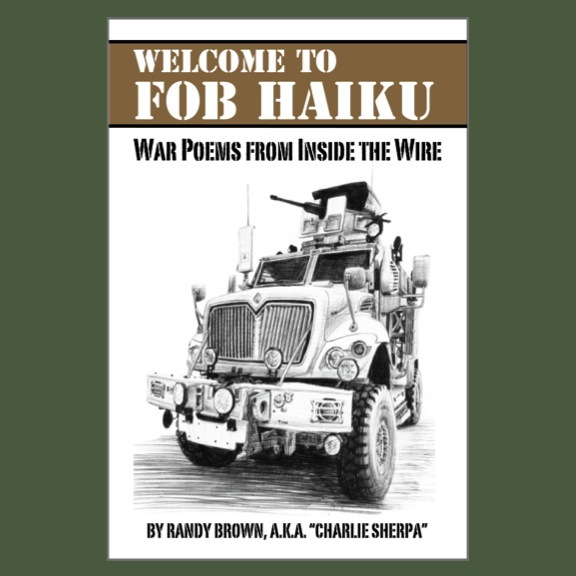 We had five fully armored vehicles, 23 Marines loaded to the teeth with rifles, grenades, crew-served weapons, and all the might and power of the United States Armed Forces. All of it was brought to a screeching halt by the most benign of animals. A lone White Donkey made us all look like asses. The donkey is also metaphorical. The white donkey could be Abe's version of Ahab's white whale. It could be his white buffalo. It might symbolize Iraq, or the Middle East. It might even be God. Nested within such rich ambiguity, Uriarte has created a smart-bomb of a literary device: A graphic novel that's graphic enough to portray the necessary bits about war being an ugly thing; sweet enough to depict the boot camp bromance of battle buddies on the road to war and back again; and downright beautiful enough to be regarded as mother-effin' literature. It's an asymmetrical weapon designed to breach the civil-military divide. A Trojan Horse, potentially getting veterans and civilians to open up about their respective wartime experiences. Yes, there are jokes. Yes, it is entertaining. Yes, it is a "comic." It is also an important book. As Brian Castner, Iraq War veteran and writer of "The Long Walk" and the upcoming "All the Ways We Kill and Die" tweeted earlier this month: "Every non-writer vet I know, the guys who don't professionally talk abt books, is talking about this @TLCplMax book." That's because Uriarte is a skilled observer of the human condition, as well as Marine life. He's an effective writer—direct, to the point, no B.S.—and a fantastic visual storyteller. Artistically, the book is a tour de force: Freed from the black-and-white tyranny of the newspaper page, Uriate's confidently executed linework is now augmented with a full-spectrum of mono-colored, ink-washed effects. He varies his color palettes, spread by 2-page spread: Greens for boot camp scenes. Khakis and dusky rose for 29 Palms and Iraq. Blues and grays for home in Portland, Ore. Purple for dream sequences. Occasionally, Uriarte punches a single object into reader awareness by depicting it in fuller color: An Iraqi flag. A U.S. shoulder patch. A bottle of Gatorade. Uriarte also experiments with splash pages—scenes that cover a whole page or spread—and occasionally fades to white during transitions. In a few climactic scenes, he boldly keeps his readers' gaze on hard-to-stomach realities, creating slow-motion sequences, splash page after splash page. This story could not be told as effectively in any other way—screenplay or novel—without diminishing the magic. In short, "The White Donkey" turns out to be a unicorn. A bright, shiny, mythical ride. A beast capable of inspiring, informing, and enlightening. Do not look away. Do not frighten it. Follow it, if you can. You might find what you're looking for.